Leadership isn’t saying what’s popular, it’s following one’s conviction. Barack Obama believes that our society needs to do a lot more to help felons reenter society productively after serving their prison time. He took this position as a Presidential candidate in 2008, and this week commended Philadelphia Eagles owner Jeffrey Lurie for giving Michael Vick a second chance. Vick was college football’s player of the year in 2000, and was the first player chosen in the NFL’s 2001 draft. He got out of federal prison fifteen months ago after serving 23 months for felony dogfighting and cruelty, then was hired by the Eagles as a backup quarterback. His hiring was controversial. His crimes were especially vile, and many dog-lovers will never be able to accept that he should ever have a second chance. Hooray for Obama for going beyond the pale to take on an unpopular issue. The United States has 2,300,000 people locked up. The vast majority of them will be let out of prison and back into society someday. If we don’t give them a fair shot at a second chance we’re condemning ourselves to live with ever increasing numbers of habitual hardened criminals. Obama’s leadership will help more people to see this danger clearly. This entry was posted on December 29, 2010 at 3:10 pm and is filed under Media, Politics, Sports, Tolerance. You can follow any responses to this entry through the RSS 2.0 feed. You can leave a response, or trackback from your own site. 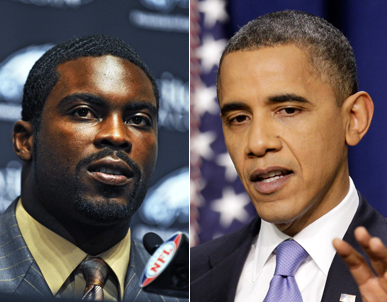 I think Vick deserved a second chance, and I think you are correct: Obama was making a responsible leadership gesture in highlighting his case. I really don’t think any praise is due to the Eagles, however. Many sports execs would hire Jack the Ripper if they thought he could win some games, and I believe this was such a case. Give the Eagles a little credit: when they signed Vick nobody else wanted to touch him, and his first year he didn’t do much of anything–a couple of plays a game as a wildcat back, hardly any production.